Requirements: SQL Server Express 14 (or above) or SQL Server 2014 (or above). To obtain information allow access to the listed below Databases tables. *Note: LcsCDR is being created when you add the Monitoring Server & Reports role for Skype for Business. This role is not installed by default. The service receives information about remote sessions via win32api, using the Win32_TSGatewayConnection function. 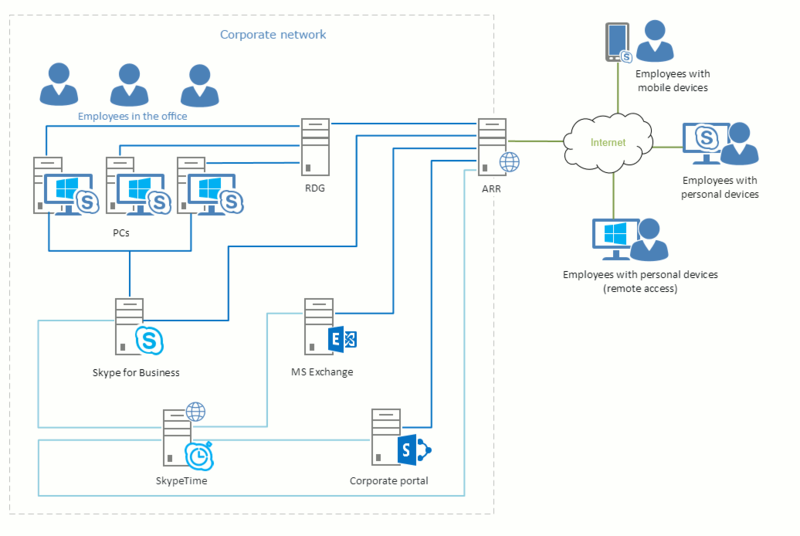 The system gather Skype for Business presence information from [rtc] and [rtcdyn] databases, the status of the Skype for Business activity (Available , Busy , Do Not Disturb , Away , Offline ), thus determining the presence of the employee in the workplace. The databases [rtc] and [LcsCDR] contain information about calls or share desktop duration, start time and end time. Information about remote connections collects from the RDG server event log. The collection service is a Windows Service Application. It is deploying on the gateway and require local administrator permissions. Received data of remote sessions is recording into database table of the SkypeTime application. To collect data about working with internal company resources (Mail, Skype for Business, SharePoint), the service processes log files of IIS and ARR servers, which are lists with detailed information about all incoming to the internal network, requests. Mail service sends notifications and creates tickets received via mail. SkypeTime connects to the mailbox through the Exchange Web Service API (EWS). As soon as mail arrives, it passing Keywords check and recording into the system database. In this case, the manager receives an email with a request for confirmation. If necessary, you can enable emailing monthly staff reports. By sending a letter, you can quickly create, approve or reject any request such as vacation, day off, sick leave, etc. The service recognizes the keywords «from», «to», «vacation», «day off», «holiday», «public holiday», «sick leave» and other variations with this meanings. For example, to request remote work, you can use the words «home», «from home», «remote», «remotely», «out of office», etc. Web Application provides user interface and access to SkypeTime reports and tools, allows to display all collected and processed information, as well as make additional changes using the web browser. The data are presented in the form of reports structured using graphs and tables. Web application runs on Internet Information Services (IIS).